In 2018 we continued to work towards enhancing public green spaces in Scandia. We hosted three talks in Scandia, including a citizen science program, and we partnered with the Marine Community Library on two other presentations. Our group furthered our work with the city staff to move Scandia forward in the Green Steps City program, and Scandia is now a certified Step 2 GreenStep City! More information on this program is available at the Minnesota GreenStep Cities website. We continue to work with the city on ensuring that the Pollinator Friendly Ordinance we passed in 2016 is honored. The ordinance that the council passed unanimously prevents the use of bee and butterfly harming neonicotinoid pesticides and requires that city plantings use native plants and avoid other pesticides whenever possible. We started off the year with a really engaging presentation about Minnesota turtles by Tim Lewis. Tim helped us to understand that much of what we thought about turtles, is actually wrong. Who knew turtles actually breathe through their butts! It was great to realize that there is still so much new information to discover! May brought a talk by University of Extension scientist, Jennifer Schultz, about the destructive Emerald Ash Borer and how citizens can help to track the spread of this invasive insect. Our June speaker was Dan Schoepke from Washington County. He spoke about waste reduction, how trash is handled in Washington County and the many products made in Minnesota from recycled products. We continue to work with Prairie Restoration on the 1.5-acre pollinator prairie at the corner of Ogilvie and Oren roads. This garden was planted on city property in 2016 as part of a cooperative effort between the 4-H group and Friends of Scandia Parks and Trails. 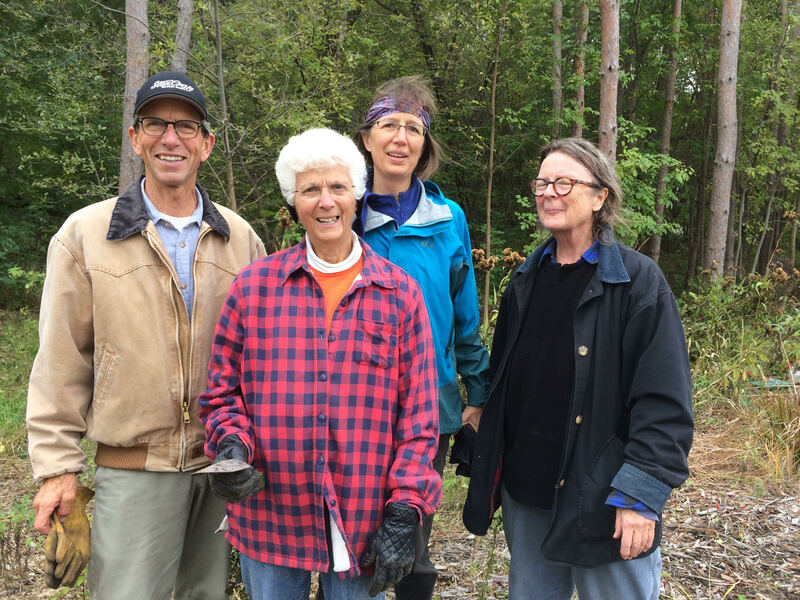 Friends members continue to work on improving the butterfly garden at Lilleskogen Park. Over 30 flowering species are now growing there. We also removed invasive Black Locust trees that were growing along the south side of the garden. Friends of Scandia Parks and Trails members have been meeting with the Gateway Trail Association to promote expansion in the area. As of now, there are plans for expansion through William O’Brien State Park ending at the old Scandia Fire Hall on Oakhill Road. Friends of Scandia Parks and Trails have contributed information about promoting nature in our community in the welcome baskets that are now available to new city residents. We were pleased to collaborate with the Marine Community Library this year on a few educational talks. Carrol Henderson, long time non-game biologist with the DNR, spoke about his career in Sept, and Peter Reich, University of Minnesota Forestry Professor spoke on the impact of climate change on forests. Our group had a tour of Standing Cedars Community Land Conservancy in Wisconsin with the former site director, Steve Rassler. Despite the late spring, it was a lovely day and we learned a lot about the history of the area. Nature Presentations will include Minnesota Birds, Luna Moths and the Decline of Insect Populations. Support City management of Parks and Trails and promotion of the Gateway Trail expansion. Advance Scandia’s participation in the GreenStep Cities program by focusing on education and youth engagement. Continue collaboration with Cycling Scandia and the Scandia Parks and Recreation Committee. If you have an interest in assisting with any of our plans, or would like to suggest some of your own, we always love to hear from you! Please consider a Tax-Deductible donation to FSPT to put your money to work on projects in our community! Checks payable to “Parks and Trails Council of MN” and write ‘Scandia Parks’ on the memo line. Thank you for your continued membership and participation in Friends of Scandia Parks and Trails. Please contact us with any suggestions you may have for future activities or to become more involved in our organization (email President Karen Schik at kaschi@frontier.com).